Strength denotes an inner power, mastery of will and development of inner might. Through mastering one?s emotions and learning from both success and failure the person Strength represents has reached a place where they are influential without applying physical force, able to weather the roughest of storms, and not likely to abandon the less fortunate. 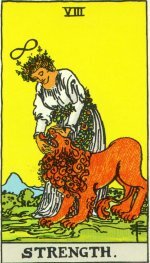 Strength also denotes a large capacity for forgiveness and compassion. Strength is not as much about winning as it is about overcoming hardship, and using well crafted persuasion to ease others to your side.